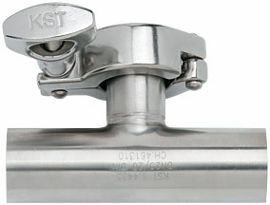 Most process and storage vessels use limit switches to prevent overfilling of the vessel (full indicator) o r dry running of a pump (empty indicator). For this reason, the range of solutions available on the market is broad, with sensors varying in terms of their operating principle and process integration. The new electr onic limit switches of the NCS series are ideally suited for the reliable measurement of limits in media with a low water content, such as certain cosmetics and alcohols. 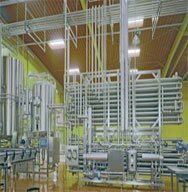 The devices are designed for universal application in all areas of the pharmaceutical and food industries. Type of medium between the electrodes. The measuring electrode and the tank wall serve as the capacitor plates while the medium acts as the dielectric fluid.Due to the higher dielectric constant (εr) of the medium relative to air (εr = 1), the capacity increases when the electrode is immersed in the medium. Exposing the electrode has the opposite effect. The change in capacity is analyzed by the level switch electronics and converted to a corresponding switching command. The sensor outputs a 24 VDC signal (active output). The minimum and maximum (full/empty) switching functions can be swapped by reversing the polarity of the power supply. The capacitive working principle requires that the sensor tip, which is made of PEEK, is completely immersed in the medium. This has the advantage that the sensor does not respond to foam or adherences and only outputs a signal when the medium actually reaches the level.Capacitive measurement is most reliable when the dielectric conductivity and temperature of the medium are constant. Changes in the outer conditions are generally non-critical in media with high εr values. In addition to the new model that replaces the NVM level switches, Negele Messtechnik has brought out another sensor that is identical in construction but that detects media that cannot be detected by the older sensor. This new sensor, NCS-x2 (Fig. 2), works with media with very low water content, such as certain cosmetics or alcohol. As with sensors of the NCS-x1 series, the NCS-x2 sensors can be substituted in directly for the old NWM sensors.In addition to the advantages that are also off ered by the NCS-x1, the NCS-x2 can be changed over between two measuring ranges (εr ≥ 2 and εr ≥ 20) with the aid of an additional input. This increases the fl exibility of this device for the user. 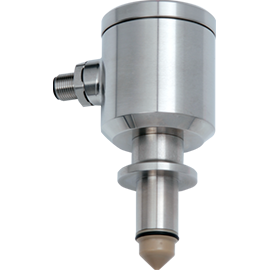 As are all products from Negele Messtechnik GmbH, the new capacitive level switches are fully suitable for all food and pharmaceutical applications. CIP/SIP cleaning for 60 minutes at temperatures up to 150 °C is not a problem. As usual, the sensor housing is made entirely of stainless steel. Parts that are in direct contact with the medium, such as the coupling part in the M12 variant, are made of stainless steel 1.4404 and are optionally available in 1.4435 with a 3.1 material certifi cate. Parts of the sensor that come into contact with the medium but are not made of stainless steel are made of PEEK, which is FDA-compliant and highly durable (Fig. 4). The maintenance-free and very sturdy sensors can be used in all areas of industrial measurement. Even their use in very adherent or aggressive media is not a problem thanks to the materials employed. As capacitive measurement makes no special demands on the installation of the sensor, the new sensors can be used in a wide variety of applications. The only requirement is that the pipes or tanks in which the new NCS are used must be conductive. In addition to an individual setting of the threshold, the 10-step rotary switch can be used to simulate a “Full” or “Empty” status. In this way, the user can test whether the PLC is working correctly with the sensor. This saves both time and money as the tank does not need to be fi lled or emptied to test the interaction between the sensor and PLC. The new sensor will also score with the user regarding the condensation resistance of the housing: the integration of heated electronics prevents condensation from forming. Integration in the process – CLEANadapt or PHARMadapt? Negele off ers two alternatives to sealing the sensors when they are integrated in the process pipelines: the CLEANadapt adaptation system and the highly innovative PHARMadapt EPA system. In the CLEANadapt system, the cone on the threaded connector is pressed against the sealing edge of the adapter when the sensor is screwed into the adapter (Fig. 4). This connection avoids dead space and is hygienically safe without the need for additional elastomers. This is certifi ed by an EHEDG or 3-A certifi cate. CLEANadapt is a hygienic system that prevents the sensor material from infl uencing the medium and makes cleaning of the equipment safe, fast, and easy. When using the CLEANadapt system, the customer can decide between weld-in sleeves or complete build-in pipes with an integrated weld-in sleeve (EHG pipe). To meet the requirements of the pharmaceutical industry, Negele developed the PHARMadapt EPA process adaptation system (Fig. 5). 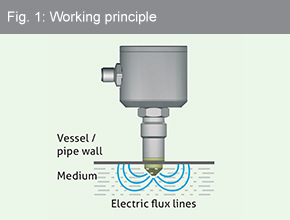 The sensors that are used with the EPA system can be built into small pipe diameters ranging from DN10 to DN100, without a signifi cant reduction in the pipe cross-section (Fig. 3). They are also well-suited for measuring media that are not electrically conductive, such as water for injection. The sensors are sealed by the cone pressing against the elastomer seal with a defi ned pressure when the sensor is in its fi nal position. The sensor is fi xed with a clamping ring. The well-matched dimensions of the sensor and adaptation result in a measuring point without dead space and gaps. The EPA system was constructed in strict compliance with the guidelines of the EHEDG – the European Hygienic Engineering & Design Group – and gives the plant operator the assurance of using a system that is easy to clean and sterilize.